In order to meet strict emissions regulations the catalytic converter (CAT) needs to clean the exhaust gas as effectively as possible. The CAT is most efficient at the stoichiometric air-fuel ratio (the point of complete combustion) as shown in the right figure, therefore controlling engine fueling in a narrow window around this point produces the cleanest exhaust gas. R33/R34 GT-R oxygen sensor on the left, R32 GT-R on the right You can see the Bosch sensor didn't come out nice. The R32 uses a smaller sized sensor (M12-1.25 threads) made by NTK. An R32 GT-R uses a titania sensor. These sensors don't produce a voltage themselves - they're resistive. So resistance changes between rich and lean. This type of sensor produces a voltage of between approx 0V for lean to 1V for rich. More info NISTUNE. The R33 and R34 use a larger sensor(M18-1.5) made by Bosch. The R33 and R34 use a zirconia sensor. This type of sensor produces a voltage of between approx 0V for lean to 1V for rich. More info NISTUNE. There is an 02 sensor in each turbo outlet pipe of an RB26. As you see above, with the constant heating and cooling cycles they go through, they can be tough to remove. 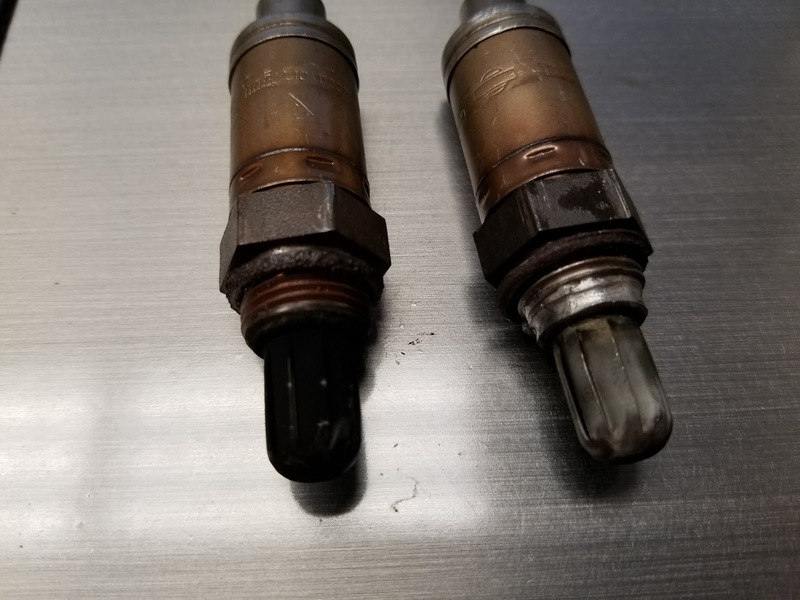 We suggest buying an oxygen sensor socket set to help you get them out. An oxygen sensor thread chaser, also might not be a bad thing to have on hand. Pin 55 is the rear 02 sensor, oval connector. Pin 29 is the front 02 sensor, square connector. This diagram is mislabeled. R33/R34 oxygen sensor closest, R32 furthest. The Bosch sensor did not come out without a fight. R32 GT-R Engine Control System Diagram. Cool explanation we found about the different types of sensors. If you are into that. Essentially, the zirconia-type actually generates a voltage, based on the differential of oxygen levels, as measured between the outside ambiant air and whats inside the exhaust itself. The Titania-type does NOT generate a voltage! Instead it is a super-quick "VARIABLE-RESISTOR" that needs a v-ref. voltage to modify. It works the exact same way as our CTS-CHTS sensors work. But instead of responding to changes in temp., it measures and responds to O2 changes instead. And it reacts much quicker than the Zirconia-type. Many manufacturers supply an EXTREMELY! low-current referrence voltage to this sensor(about .450-volts),especially during warm-up, to more-or-less help stabilize A-F before the sensor exceeds 600-degrees Far. At approximately that temp. (lower for newer, fresh sensors), the sensor starts to become actively generating a voltage with enough available current to "conquer" or over-power the ultra-low current V-ref. that the ECU provided. This is the exact point in time and temp that the O2-sensor becomes full-ready and goes on-line. Thusly, the zirconia actually produces a voltage and current. This was the first type of O2-sensor widely used in cars. Overall, it's main advantages are that it cheaper to produce and relative ease of maintaining good manufacturing quality-control for consistant results. It is generally accepted as being tougher and more durable than than titania-type sensors...It has a higher survivability-factor! Remember...The inside of an exhaust manifold or just behind a cat can both be VERY! hostile enviroments! The titania-type O2 sensor was developed because of the need for a quicker-responding, quicker reacting sensor to comply with ever-tightening emission standards. Obviously, the easiest way at the time to get better control of emissions was to do everything faster! In the mid-'80s, a faster sensor was developed , tested and then actually used by a few car-manufacturers...One of the very first to use this "new and faster" sensor was NISSAN !!! 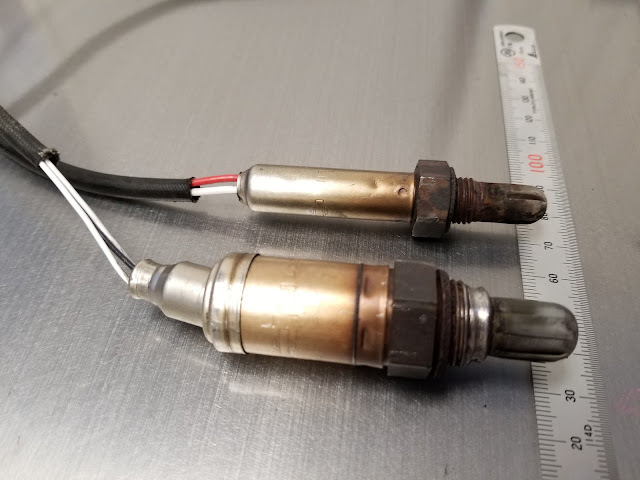 Nissan used this type sensor only on some of their "Premium" vehicles until about 1994. Added bonus...The Titania-type is capable of being more accurate sooner during cold start-up, at lower temps. It comes "on-line" quicker.Overall, the Titania was/is much more difficult to produce accurately and consistently, compared to the Zirconia-type. AND! it's not as tough-and-durable, overall ! The cost thing is probably the main most other manufacturers were slow and reluctant to evolve toward using the newer Titania. Summary >>> Tighter and tougher emission regulations forced technology to respond to build a faster reacting sensor...It's just that simple! Because the Titania-type sensor DOES NOT produce a voltage, it MUST be matched to a ECU or computor ORIGINALLY intended for Titania-sensors. Neither sensor will function properly when "swapped" to the other system. It is possible, MAYBE, that a Titania-type computer MIGHT! work acceptably with an input from a Zirconia-sensor. 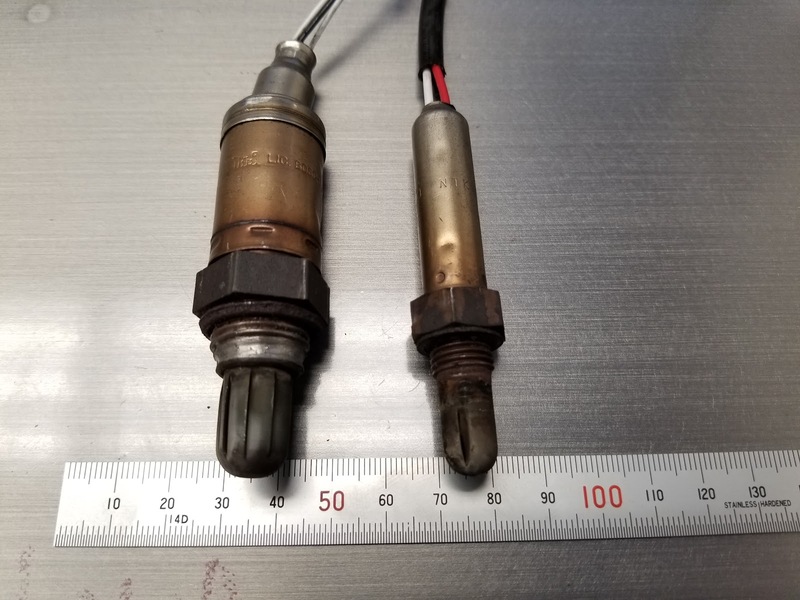 In this case, do not connect the 1-volt v-ref to the O2-sensor. The Titania-based sensor is now being used more and more commonly by many manufacturers. Including Nissan. Again! Some companies are referring to them as "wide-band" sensors.